HOLLYWOOD actor George Clooney visited a sandwich shop that provides meals for homeless people this morning. The star, who has strong Irish roots, visited Edinburgh to pay a very special visit to Social Bite, where he met former Big Issue vendors and those who had been homeless. Hundreds of local people and tourists turned out to catch a glimpse of the star nicknamed ‘Georgeous George,’ as he took a selfie at the shop and stopped to shake hands with fans. The Oscar winner, who carries out a great deal of humanitarian work, is very fond of Edinburgh and Ireland. Today, Clooney spent time chatting with those at the forefront of making a social difference to the lives of Edinburgh’s homeless. The actor, married to Amal Clooney, a humanitarian lawyer, is reported to have left a £650 cheque for the cafe. Former Big Issue vendors Colin and Sonny, sold the magazine in the city and now work in the Rose Street Cafe. “Only two years ago I was living on the streets of Edinburgh with a heroin addiction and unable to even afford to eat,” said Sonny, 36. “Today I’m in full-time employment, have an amazing family and I just made lunch for one of the biggest stars on the planet. Enterpreneur Josh Littlejohn, who co founded Social Bite, set up the star’s visit. He said: “George is an incredible guy, someone who has achieved real global fame but thinks nothing of visiting a local sandwich shop to chat to the workers and discuss the issue of homelessness. “He was delighted to spend time with some of our formerly homeless staff and hear the stories of how they have transformed their lives through full-time work. The innovative cafe have seven premises in every big city in Scotland and was established by Littlejohn and Alice Thomson in 2012. The star will also attend the Scottish Business Awards tonight, where profits from the event, will go towards Social Bite’s chosen charities. 2,000 are expected to attend and a portion of the money will also go to Clooney’s charity Not On Our Watch. Ireland Today were in attendance and spoke to some of the people who turned out to meet the star. One fan who met Clooney, a young woman, said: “I can’t believe it. George was so handsome and down-to-earth. He shook my hand. The actor also shared lunch with a local wedding planner who won a competition. They tucked in to a Scottish-themed five course lunch at Tigerlilly on George Street in the city centre. Waitresses Hannah Stevens, Abigail Banks and Ursula Giltenane were picked from Tigerlily’s team of staff to serve Clooney at the invite-only meal. Hannah said: “It was a real thrill to be asked to serve Mr Clooney and we were all a bit nervous. “But he was so courteous and pleasant all the way through the meal. “He looked so relaxed and was happy to chat to everyone. Around 25 guests were invited to the secret lunch, including Heather McGowan who won a charity competition to dine with Clooney. The lunch included salt aged Inverurie beef carpaccio, pan-fried Scrabster cod and Scottish specialist cheeses. The menu was created by Helen Robertson Food Development Director at Montpeliers Ltd, who run Tigerlily, and Tigerlily head chef Curtis Williams. Helen said: “We spent months planning the menu and tried various ideas and dishes. “We wanted to provide a menu that showcased the best of Scottish produce and local suppliers. Five chefs from Social Bite joined the Tigerlily team to work on preparing and serving the menu. As well as the lunch, Tigerlily also had a number of VIPs taking part in the Scottish Business Awards staying the night, including host, comedian Rob Brydon, TV’s Chris Evans and his wife Natasha, cycling hero Sir Chris Hoy and business guru Sir Tom and Lady Hunter. Montpeliers Managing Director David Wither said: “We have been fortunate to welcome a number of celebrities and well-known names into our units, but George Clooney pretty much is as big as it gets. “While we are always delighted to welcome VIPs in normal circumstances, in this case it was really pleasing to play host to such a superstar visitor as well as helping such a great cause as Social Bite. “We also heard from our staff that he said we had ‘quite a place’ in Tigerlily, so that was great to hear. 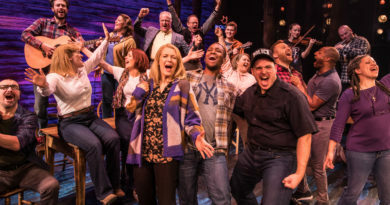 “There was a great buzz around the place – not least from our staff who were itching to get a chance to be near him or serve him. “It was great that we were able to serve George with some of best produce that Scotland can offer – and it was a great thrill for our staff to have such positive reaction. 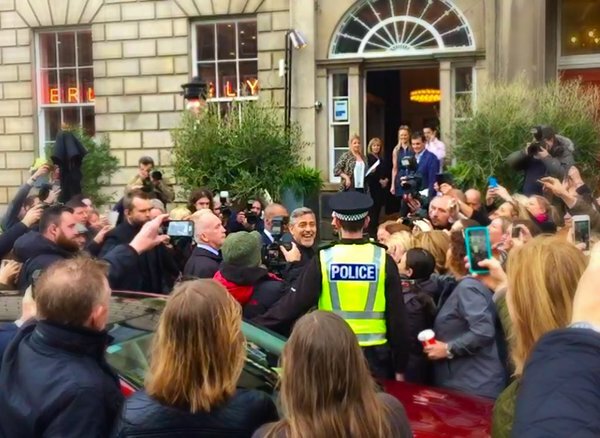 “No additional security had been put in to place for the actor’s visit but it was top secret which cafe in the city Clooney was going to visit until the last minute. A resident, who had previously met Clooney in the city, said: “George comes here secretly sometimes. He loves Edinburgh. “I met him in a bar a while back and he was so down-to-earth. I went over and had a chat and a drink with him. Fair play George! Come to Ireland soon.